Signs are up stating that the back road will be closed for resurfacing between Monday and Friday. I didn’t see anything on clacksweb about it so this is based purely on where I’ve seen the signs but it looks like the section between Balquharn Farm and the Ochil Road / Long Row / School Lane junction by the Hollytree in Menstrie will be closed for a week. 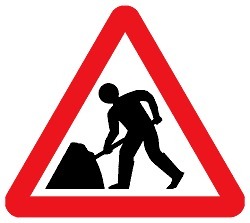 The junction at Broomhall Castle has been in need of some patching for a while now as have other sections of the road so it will be good to be able to travel on a smooth surface.